There are no workshops planned for the immediate future as we are hosting the 2019 National Oral History Conference. 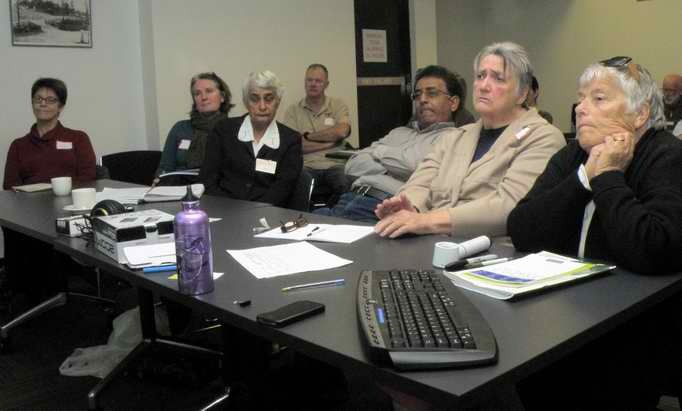 On Saturday, 4th August 2012, OHAA-Qld held an oral history basics workshop at the Toowong Library. I facilitated the workshop, and secretary Suzanne Mulligan supported me, staying for the whole day to share knowledge about interviewing, equipment, sell Oral History Handbooks and enlist new members. The workshop moved through the steps in an oral history project, from budgeting, the basic equipment, writing information and consent forms, ethics, copyright, designing interview questions, what to do with oral histories and evaluating projects. Fourteen participants attended. Robyn Elphinstone travelled all the way down from Townsville on a Regional Arts Development Fund (RADF) grant to attend, so she could collect stories from the Burdekin. Ian Gray crossed the New South Wales border to join us, so he could learn how to gather the oral histories for a gay and lesbian history of Northern Rivers. Janeth Deen and Wilma Bothwell from the Queensland Muslim Historical Association came to learn how to gather oral histories for their project to document the history of Mosques in Queensland. Mustafa Ally, also from the Queensland Muslim Historical Association, hopes to gather memories from Muslims and migrants. Alison Early, from the newly formed Bulimba Historical Association, plans to gather interviews to learn more about the sailing club’s history. Tony Irwin, from the Defence force, intends to gather oral stories from veterans. Gaye Hegeman hopes to gather oral histories to augment her creative nonfiction writing for the Kytherian Community. 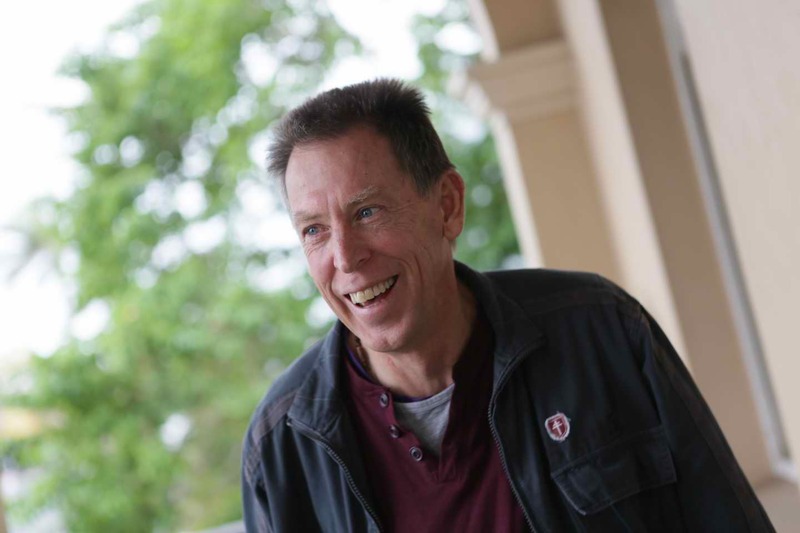 Lisa Fitzgerald, from the University of Queensland (UQ) is collecting oral histories of people living with HIV, and, in the future, plans to collect oral histories about the experiences dealing with the Christchurch earthquake. Maggie Dunbabin came back after attending a few training days last year to refresh her skills. Karina Talbott, a student at UQ, is working on a project to collect the stories of experiences volunteering in Indigenous communities in the Northern Territory. Ross Gwyther, from the Brisbane Labour Association, plans to collect stories from Communist Party activists from the 1940s and 1950s. Camilla McRae has worked for a number of years on a research project related to a community festival and will continue to gather relevant material. It was great to hear so many diverse and valuable oral history projects are in the pipeline. It was a pleasure to support the enthusiastic participants to develop best practice methods to enrich Queensland and New South Wales’ history. Thanks to a Gambling Community Benefit Fund grant and the support of Lara Clarke at the Mackay library, facilitators Bryan Crawford and Ariella Van Luyn were able to travel to Mackay on 7 and 8 July 2012 to run an oral history workshop. We arrived in Mackay at 8.30 on Saturday morning to find a keen participant already waiting outside the Old Town Hall for us to begin. Lara let us in through the big wooden doors at the entrance. The workshop was held in the arts space on the second floor. To get there, we climbed up a flight of wide wooden stairs with spherical decorations on the railings worn thin from contact with hundreds of hands over the decades. The workshop space was a square room skirted by arched windows that let the soft light drift through, and a verandah hemmed with iron balustrades. Below us was the visitor information centre. Throughout the workshop, participants shared their local knowledge with the tourists that wandered through. Eight participants attended. Ruth Wegner from Walkerston and Janette McGrath from Mackay hoped to learn more about their family histories. Ruth wanted to interview her Father-in-Law about his time on the Kokoda Trail. Brian Osborn and Julie Worldon were from the Greenmount Homestead, five kilometres West of Walkerston. The Greenmount Homestead ‘contains a number of buildings including a 1915 Queenslander homestead, which houses intact a collection of more than 20,000 historical items’ Brian and Julie hoped to collect oral histories documenting the rich history of Greenmount and surrounds. The Mackay library planned to launch the second phase of its ‘Mackay through the Decades’ project. In the first phase, Mackay community members donated over 200 images of the region to the library from ca. 1950s onwards. Now, staff members plan to gather oral histories around particular images, capturing the rich and personal history frozen in the snapshots. Others came to simply learn more about oral history. The workshop took participants through the steps in an oral history project, discussing budget, ethics and permission forms, equipment needed, using audio recorders, stills and video cameras, conducting preliminary interviews, designing questions, outcomes and evaluation. The participants had a chance to design questions, conduct and record a practice interview. 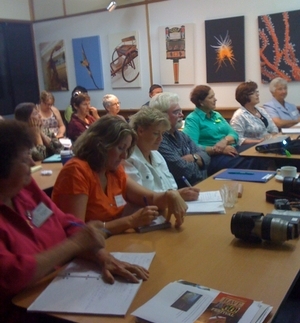 By the end of the workshop, participants were enthused and hope to start an oral history group in the Mackay region. 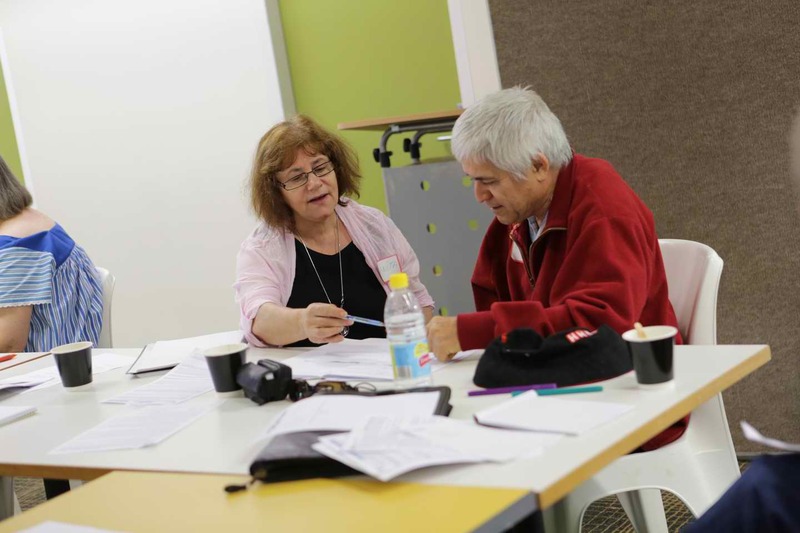 On 19 and 20 May, Helen Klaebe, Bryan Crawford and Ariella Van Luyn flew to Townsville to run a two day oral history workshop at the Thuringowa Library, Townsville. 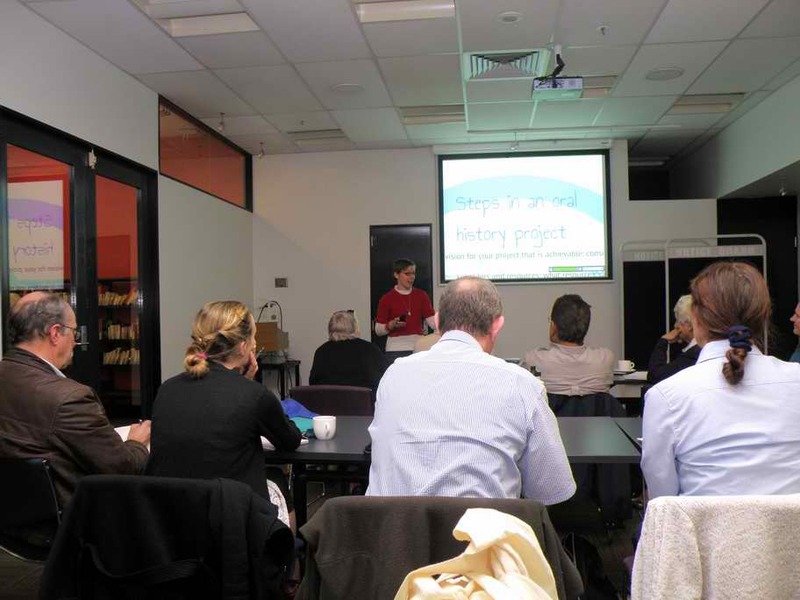 The workshop was a collaboration between the library and the OHAA Qld. Annette Burns, local history librarian at Townsville, with the support of library staff, arranged flights and accommodation for Bryan, Helen and Ariella, and organised the venue and catering for participants and facilitators over the two workshop days. The facilitators’ fees were paid for with a Gambling Community Benefit Fund Grant. Eighteen participants attended the workshop for diverse reasons. Participants included Alicia Bolam, Annette Burns, Robyn Maconachie, Barbara Mathiesen and Janeese Henaway from CityLibraries, Townsville. Judith Ecuyer travelled from Saunders Beach, looking for advice on her current projects on the history of Saunders Beach and her own family. D’esley Smith from the Performing Arts History Society Townsville (PAHST) is hoping to record oral histories from Townsville artists. Phil Heang, from Writers in North Queensland, plans to rely on oral histories to augment his play writing. Kerry Kendall and Cliff Robinson both hope to capture stories from Bush men and women. Kris Patterson from the Zara Clark Museum in Charters Towers, plans to record oral histories of residents in Charters Towers. Maxine Cuddihy, from Townsville, hopes to use oral stories for their family history. Jenni Townsend wants to collect oral histories to augment her work in Indigenous education. Others, like Diane Laun from Townsville, Sharon Russo from Ayr, and Fiona Scott from Home Hill, came along without a project in mind, but hoping to learn more about gathering oral stories. On Saturday, the group spilt in two. Facilitators Helen and Ariella took half the participants through the steps in an oral history project, budgeting, and writing information and consent forms. Meanwhile, Bryan showed his groups the basic equipment needed for an oral history project, and worked with them to get some hands on experience using audio equipment. The OHAA Qld’s new H4N Zoom recorders had their first outing, as Bryan and his group opened the boxes and tested them out. After lunch, the groups swapped. In the final session, Helen and Ariella took the group through planning the preliminary interview and designing questions. After Helen and Ariella gave them feedback, participants went home to work on their questions, ready to test them the next day. In the evening, Bryan, having passed through Townsville but never actually visited the town, finally fulfilled one of his dreams: to walk down The Strand and have a beer looking out over the ocean to Magnetic Island. Ariella was more than happy to join him. On Sunday, the groups reconvened and recorded short oral histories in groups. After a quick Morning Tea break, the entire group listened to interviews, reflecting on the questions asked, interviewing technique and recording quality. The afternoon was spent thinking about ways to present oral histories as digital stories, family histories, traditional histories, fiction and nonfiction, as well as in museum displays and exhibitions. Helen took the group through evaluation processes, sharing the recent research she has gathered as part of her Smithsonian Fellowship. Helen had also brought along some digital stories, which were outputs from a number of oral history projects, she, Bryan and Ariella had worked on. Helen showed the group digital stories made as part of the collaboration between Cardwell Historical Association and the OHAA Qld, funded by an RADF grant, which documented stories from the aftermath of Cyclone Yasi. She also played digital stories from her PhD, ‘Sharing Stories: Kelvin Grove Urban Village.’ These stories, speckled throughout the two days, keep the group entertained and enlivened. The group was keen and happy to participate. Helen, Bryan and Ariella found them a pleasure to work with, and they shared a lot of laughs over the two days. Library staff plan to set up an oral history group in Townsville, based at the library and supported by staff members. It will be exciting to learn about the new projects and stories collected as part of this enthusiasm for oral history practice in Townsville. The Oral History Association of Australia, Queensland branch (OHAA Qld), in conjunction with the Cultural Heritage Network – Toowoomba Region, held an Oral History Basics Workshop in Toowoomba on Saturday 4th February 2012. The workshop was made possible thanks to the generous support of the Cultural Heritage Network – Toowoomba Region, the Cobb+Co Museum, and a Gambling Community Benefit Fund grant awarded to OHAA Qld. While the Gambling Community Benefit Fund paid facilitators’ fees, Karen Barrett, OHAA Qld Committee member and President of the Network, organised the workshop locally, drumming up interest and liaising with participants. Unfortunately, on the day of the workshop Karen was sick, and could only come for a brief time in the morning. Nineteen people attended the workshop. The participants were Jean Sorley from Bell Progress & Heritage Association; Chris Bermingham from the Western Downs Libraries, Dalby branch; Fay Twidale from the Millmerran & District Historical Society; Buddy Thomson from Boondooma Museum and Heritage Association; Karen Smith and Angela Matthews from Bowenville History and Heritage Association and Queensland Parks and Wildlife Services; Cynthia Conway from Clifton Progress Association and Museum; Dorothy Haig from Allora Historical Society; Susan Stilgoe and Trudy Graham from Murphys Creek Neighbourhood Centre; Bronwyn Lloyd from Gympie Woodworks Museum; Denise Miller and Ross Jurgs from Toowoomba Grammar School Museum; Stephanie Keays from National Trust, Toowoomba; Jenny Black from the Glennie School Archives; Noeleen Bird and Iris Crumpton from Blackbutt District Tourism and Heritage Association; and Angie Walsh from Surat Aboriginal Corporation. 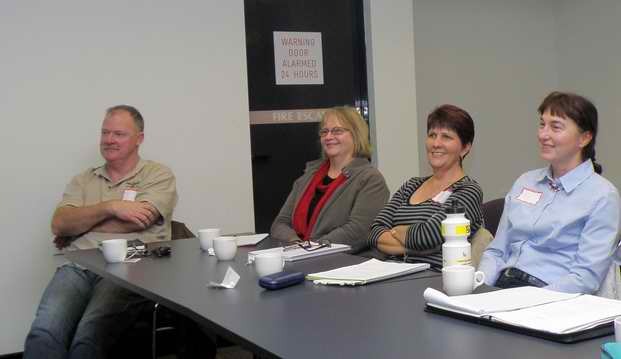 OHAA Qld member and facilitator, Sue Pechey, also came along to refresh her skills. Unfortunately, two participants were flooded in and unable to attend the workshop. Some participants attended because they wanted support for their specific projects. Jenny Black wants to collect oral histories from past staff and students who went to Glennie. Angie Walsh hopes to collect stories of Indigenous elders, focusing on those dwelling on the fringes. Noleen Bird and Iris Crumpton plan to use oral histories in the museum at Blackbutt and deposit them in their archives. 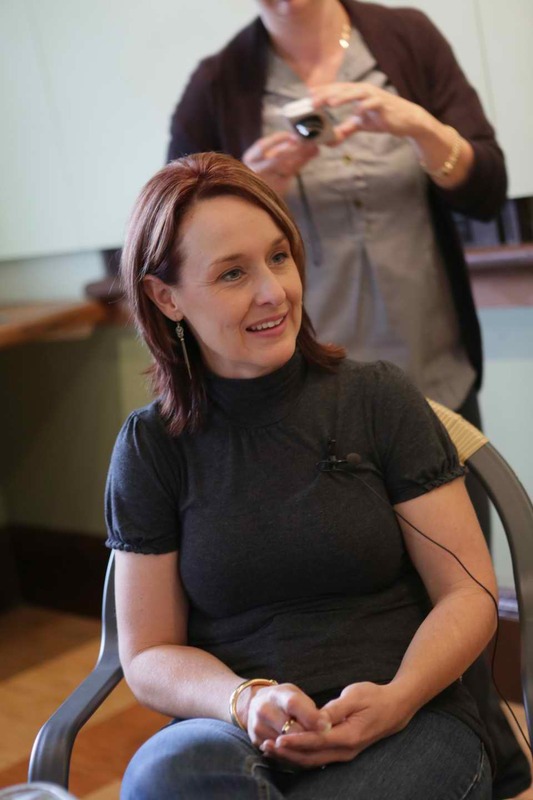 Architect Stephanie Keays wants to contribute to heritage week in 2013 by combining oral histories with her knowledge of buildings. Denise Miller and Robert Jurgs intend to collect stories from old boys and past staff of the Grammar School. Brownwyn Lloyd wants to gather oral histories from local timber cuttings to use in the woodworks museum. Trudy Graham and Susan Stilgoe hope to build up a better picture of the history of Murphys Creek through oral histories, to include in the railway museum and local historical cottages. Dorothy Haig is working on a project with residents of an Aged Care Home in Killarney. Karen Smith and Angela Matthews plan to gather oral histories from residents in Bowenville to use in their museum and railway interpretative centre. Others simply wanted to find out more about oral history or think about the possibility of using oral histories in community initiatives. Facilitators Bryan Crawford and Ariella Van Luyn drove from Brisbane on Saturday morning, arriving at the Cobb+Co Museum at 9am. The museum is next to beautiful Queens Park and flanked by five towering windmills. The workshop was held in the theatrette at the far end of the museum. In the corner a mannequin of Henry Groom, dressed in Victorian Garb, watched over the proceedings. The workshop gave participants an overview of an oral history project, taking them step-by-step through the processes involved and aspects to include in a budget. The morning session, with Ariella Van Luyn, focused on ethics, copyright and permission forms. 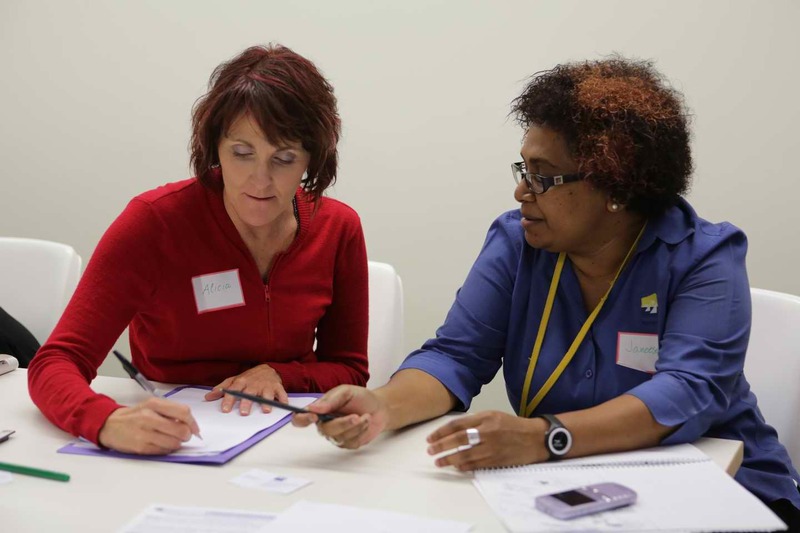 Participants heard about the importance of being an ethical interviewer, and saw example permission forms from the State Library of Queensland and the Queensland University of Technology. Participants had a chance to think through the details of their own projects, and consider what they’d write on an information and consent form. After lunch, served by the Cobb+Co Museum, Bryan Crawford took a session on the equipment needed for an oral history project. Participants then had the opportunity to hear about interviewing techniques and what to expect in an interview. In the final session, after an afternoon tea of scones with jam and cream, participants had a chance to practice their interview questions and techniques on each other. This session buzzed with the excitement of sharing stories. The only disappointment was the need to change venues (at very short notice) from the Transport and Main Roads Heritage Centre. 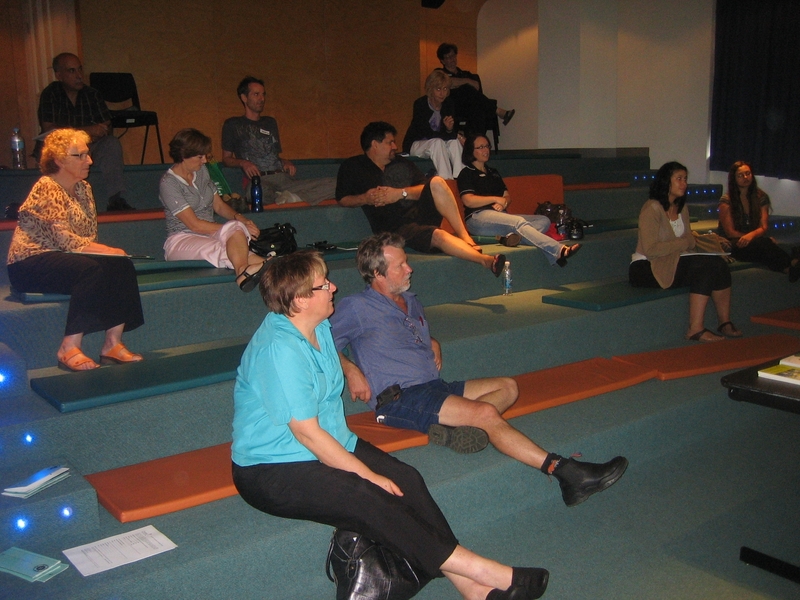 OHAA (Qld) thanks the Cobb+Co Museum for quickly accommodating us and providing a wonderful workshop venue. 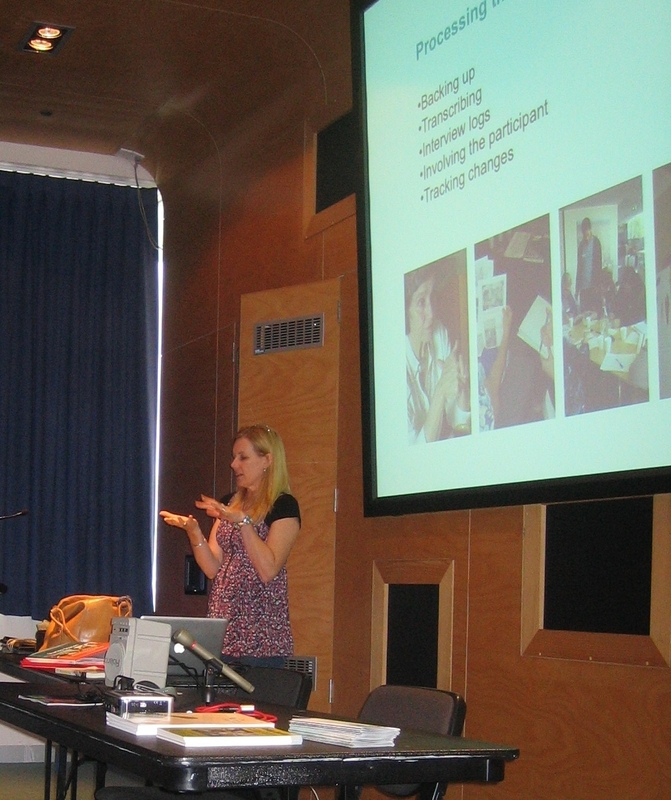 We would also like to thank Karen Barrett and the Cultural Heritage Network – Toowoomba Region. 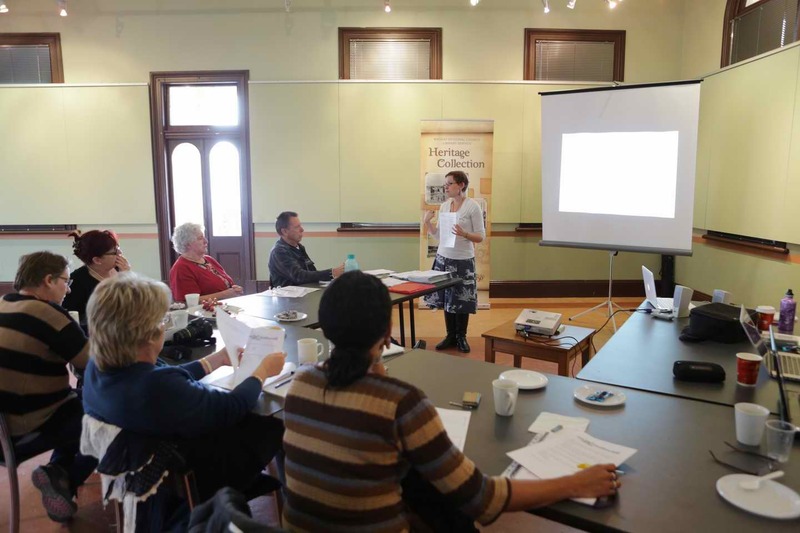 We appreciated the opportunity to make partnerships with rural communities, and to step outside the Brisbane-centric model of oral history training. 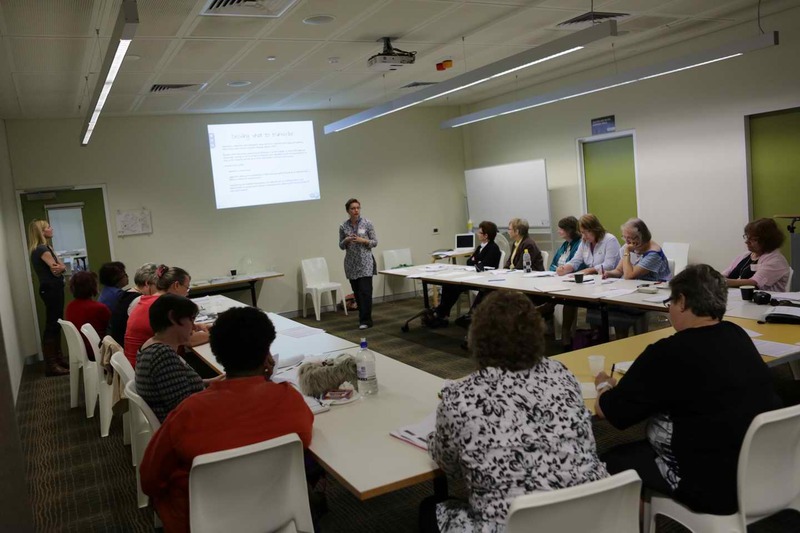 Thanks to the Gambling Community Benefit Fund grant, OHAA Qld will also be running similar workshops in Mackay on 20th and 21st April and Townsville on 19th and 20th May. 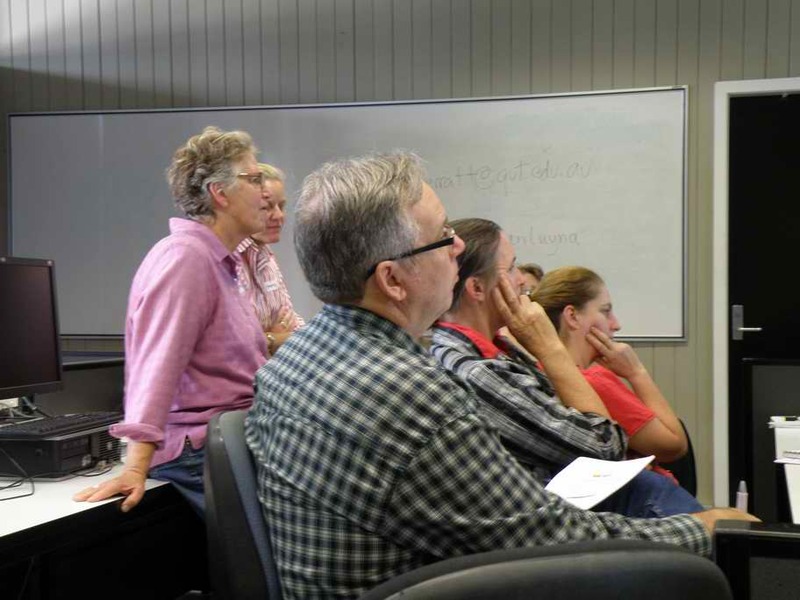 A workshop is also planned for Cunnamulla, but the details are yet to be finalised. 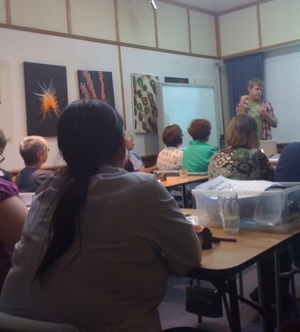 We also plan to hold basics workshops in Brisbane in May and November 2012. If you are interested in attending any of these workshops, please contact Ariella Van Luyn: a1.vanluyn@qut.edu.au, and/or watch the blog (http://www.ohaaqld.org.au/index.php?/Blog.html) and e-news bulletins for details. 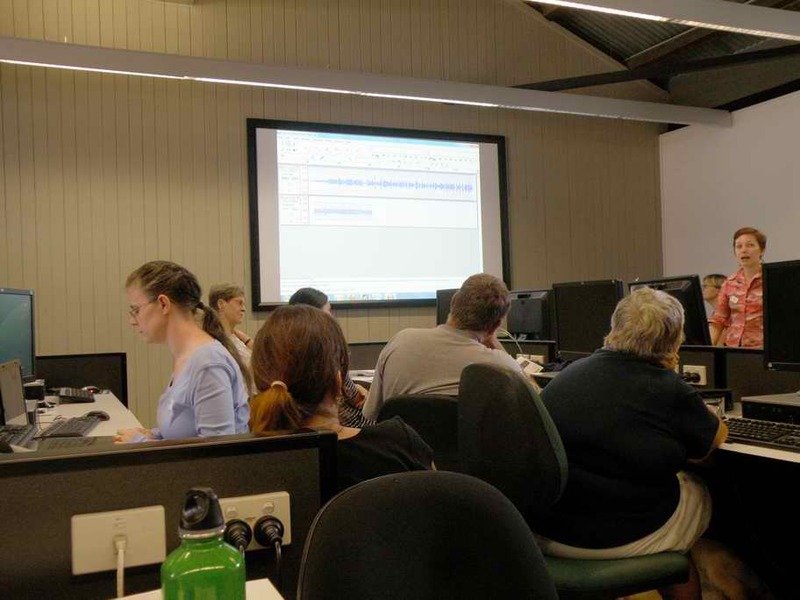 We had a good attendance at our April workshop which covered recording using the recording equipment, introduction to sound program Audacity, file management, editing and transcribing using Express Scribe software. It is good to see the variety of oral history projects people who come to our workshops are doing. We had someone who is interviewing former politicians; another has an exhibition featuring her stories at the Museum of Brisbane; someone from a regional area collecting stories from her community; someone from a suburban library who would like to get local people involved in recording stories; volunteers from military museums who will be collecting some interesting and important stories; someone who is working on the history of her church; students who are working on projects related to their studies; a resident of a retirement village who will have a wealth of stories in her immediate area. These are samples of the myriad of applications for which oral history is used. The workshop was held in a computer lab at Queensland University of Technology at Kelvin Grove. The class was divided into pairs so they could practise interviewing using the equipment provided or their own equipment. The interviews were then uploaded to the computers to practise sound editing using the free software Audacity. Unfortunately, there were technical glitches with some of the computers and participants had to share the ones that were working. After lunch the participants were shown best practice in managing the files for their project, particularly when managing a large project. Good organisation of files will ensure that all steps are taken with each interview so that nothing is forgotten. Depending on the project, it is often best to transcribe the whole interview so that it can be searched in the future by the interviewer and other people researching the interviews. There is a trend now, mainly because of cost, not to transcribe fully but to have a summary of key points of the interview. There are some who may not transcribe at all. Express Scribe is another free software program which is a good tool for the oral history interviewer. There was some good feedback about the workshop, verbally on the day and later by email. They had a good overview in how to use Audacity and Express Scribe. They would like to have had more time practising on the recorders and using Audacity. As we were using the computer lab, it cut down on interaction within the group to some extent, as oral historians like to meet each other and compare notes. All feedback is gratefully received so that OHAA can take that on board when designing future workshops. 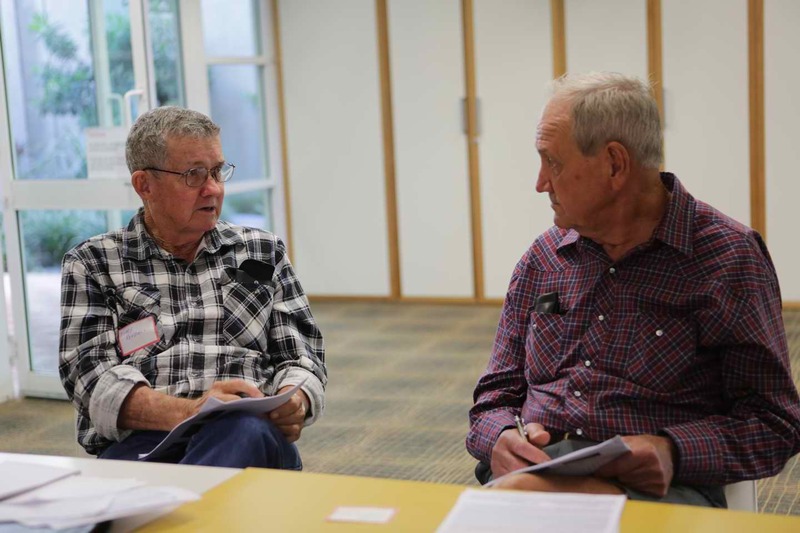 On 27th February, the OHAA, Queensland branch, ran a ‘basics’ workshop, which equipped participants with the foundational skills needed to start and run an oral history project. Dr. Helen Klaebe facilitated the workshop. Issues covered included conducting interviews; copyright; ethical clearance and the use of technology in recording and presenting oral history. Bryan Crawford took a session on photography. A diverse range of people, working on a variety of projects, attended the workshop. Hamish Sewell, a writer and radio producer at Radio National, is currently working with the Murray Darling Basin Authority (MDBA) on a project gathering oral histories around the Murray Darling Basin in order to raise awareness of the impact of the river in both a social and scientific context. Hamish is also interested in establishing a project, The Story Project, based on the StoryCorps model (the OHAA delicious site has details on StoryCorps). Carmen Burton, a curatorial assistant at the Museum of Brisbane (MoB), was about to begin an oral history project at Museum. Sue Gammon, youth and community services librarian, and Peta Brown, came all the way down from Bundaberg to attend the session. Gill Ford, a student from the University of New England (UNE), was able to take away some of the practical advice for her class on oral history. Salvatori (Sam) Di Mauro, is a lecturer at Griffith. His research focuses on the relationship between vernacular culture, object and environment. Jay Ludowyke, a new member, is conducting interviews with her relatives who migrated from Sri Lanka in the 1970s. Joy Stacey, from the Brookfield Historical Society, is interested in interviewing people about the history of that area. Mary Brooks, a new member from Narangba; Ross Peddlesden, Manager of ABC Radio Wide Bay; Lindsay Hariss, from Southport School and Philip Seiler from the Railway Workshops Museum also attended. Participants gave positive feedback, some stating that the workshop was well organised and not too formal, with information presented in an interesting and logical sequence. Participants enjoyed the diverse mix of participants and the contribution they made to discussions. Helen was described as a lovely, warm personality, who obviously knew her stuff. Bryan was described as engaging, super helpful, and a natural teacher. Participants also provided some constructive criticism, which the committee will take on board in planning future workshops. For many, the venue at the Brisbane Square library was the biggest drawback. Participants also asked for a checklist at the end of the workshop to reinforce the salient points and wanted more detail on interviewing techniques. A workshop with more details on interviewing techniques and transcription was also requested. An ‘equipment’ workshop will be run on Saturday June 5. A workshop specifically on editing and transcribing will be held on Saturday September 11. More details on these will be available in later newsletters and on the website. We had our final workshop day for the year with a number of interesting presentations. Once again OHAA (Qld) is very grateful to the State Library of Queensland for providing us with such an excellent venue. We had an interesting day covering different aspects of oral history, starting out with Helen Klaebe and a “basic” oral history workshop. Helen also showed some of her digital stories from the “Apology” project. See http://www.qldstories.slq.qld.gov.au/home/digital_stories/apology_responses Later Bryan Crawford covered the use of still camera, video cameras and voice recorders. He discussed the relative merits of different types and showed there is something for every budget. I then showed how to publish interviews on to a Blog. (see my guide elsewhere in this newsletter). The State Library’s Oral History and Digital Storytelling Coordinator, Gavin Bannerman, then gave an overview of the SLQ’s oral history collection. As a special treat, we had Francesco Ricatti give us his presentation on “Italians in Brisbane – Oral (Hi)stories of Hope”. An interesting discussion then followed. Our workshop participants were once again a variety of people with some very interesting projects they have either already started or will be commencing in the near future. We had Ariella van Luyn, a QUT student who uses her oral history recordings to create fictional works. Noela Carr from Queensland Girl Guides plans to record the stories of former Girl Guides to build on the history of the Guides in Queensland. Noela said she found the workshop useful as they are “starting from scratch.” Antoinette Cass came from Bond University to learn about oral history so that it will form part of the corporate history of the university. Gail Taylor and Trish Henningsen were from Chinchilla Historical Museum and they plan a project interviewing the elderly residents of the Chinchilla area to help build their history from a personal perspective. Donald Kerr travelled from Barcaldine to be with us. Cathy O’Connor, Gail Halliwell, Rosalie Rasiti and Denise Sherwood are doing a project with the Brisbane Kindergarten Teachers College Graduates and Friends. We were encouraged to receive positive feedback from all participants so we are pleased to know our workshop will be the first step for their projects. Future OHAA workshops will take them further and we will look forward to seeing them again. It was a successful day with the workshop participants gaining new knowledge which will help them pursue their oral history projects.